A FRIEND who lives in the province e-mailed me last week after he had read my previous columns on dating. Gene – which is not his real name, of course, or he would kill me – brought up an interesting issue in his note. He was anxious about his own dating situation. He thinks she likes him a lot, too. But Gene has yet to ask Cindy out for The Big Date. You know, the one where he will have to actually pick her up from her home and meet her kids, before he can take her out to a fine-dining restaurant or a movie. Right now, all he’s done is bring her home after work, but he has yet to set foot inside the abode and meet the little monsters. What to do? What to do? Of course, after calling him a wuss, and berating him for having no balls to move forward and ask the possible wife-material out on a real date, I did acknowledge his fears that pursuing a relationship with Cindy may bring a few challenges. It won’t be easy because there are other individuals involved whose feelings he will have to be sensitive to. But if he and she are really determined, perhaps they could make the relationship work. I told him that for all he knows, his fears could be unfounded and the kids could actually like him. Nevertheless, it’s always good idea to put your best foot forward as in any situation. Okay, it’s the day of the big date. You’re off to pick up your lady and meet her kids for the first time. Bring a gift, why don’t you? Sure, everyone, especially the kids, will know you’re just sucking up to them, but it is a respectable gesture nonetheless. Besides, it will make you feel good about yourself if the kids do like the gift, and will also stack up the pogi points in your favor with your beloved. Now, you don’t have to give the kids the latest PlayStation or an Xbox console as they’re not yet your stepkids, okay? It can be as simple as chocolates, or comic books, or maybe a music CD or a movie on DVD. You will have to do a bit of research on this, and find out from your discussions with your intended paramour what exactly her kids are interested in so that you can buy them the appropriate gift. Remember, that there will always be her ex- to deal with. Good for you if your lady and her ex- split up amicably, and both have agreed to go on their separate ways and not interfere in each other’s dating habits. But if there are still lingering feelings of either love or jealousy between the two of them, watch out. You may suddenly wake up one morning with your hands and your feet tied down with weights while you slowly drown at the bottom of someone’s swimming pool. The ex- will be your toughest audience. He will, of course, assess your suitability to be his children’s step-parent. At his worst, he will probably do a background check on you to see if you have ever been a convicted felon, a drug addict or a child molester. In short, the ex- will probably not like you, no matter how respectful you are of his relationship with his kids and his ex-wife. Just accept the fact that your lady’s ex- will never be your No. 1 fan (unless he’s Bruce Willis and you’re Ashton Kutcher), even if – or especially if – his kids learn to love you. So just keep looking behind your back, bub. Remember that the kids will always come first. So be prepared to have your grand plans with your beloved be broken at the last minute (“Mikee didn’t tell me he has an art project due tomorrow, and we still haven’t bought the materials!”). So you spent a humongous amount of money to buy scalped tickets for a concert of her favorite singer? Forget it. There will be times when she will cancel on you because of what you will probably feel are poor excuses (“Cesca came down with the flu kasi!”). You won’t be able to do anything about this. Your efforts at planning a long-awaited dinner at the newest restaurant with the long reservation list will never stack up to the sudden problems your lady will have to deal with at home. However, try not to fall in love with your lady’s kids too much. For some, the relationship with Ms. Lady With Kids may not always lead to a positive outcome. For one reason or the other, there might be a breakup, and where would that leave you and your relationship with the kids? 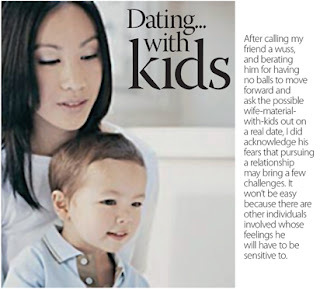 Of course, staying cool all throughout the dating process with their mom will be difficult, especially if they are actually lovable children. And you don’t have a stone-cold heart to begin with. But just make sure that if a breakup does come, you will have enough strength to reassure the children that while you may no longer be around in their lives regularly, they will still have a special place in your heart. But, sorry, there can be no more late-night phone calls about monsters under their bed.